Germany Agrees To Pay Kindertransport Survivors Who Escaped Nazis As Children About 10,000 Jewish refugees under the age of 17 were relocated through the rescue operation. Most never saw their parents again. The Claims Conference estimates there are about 1,000 still living. 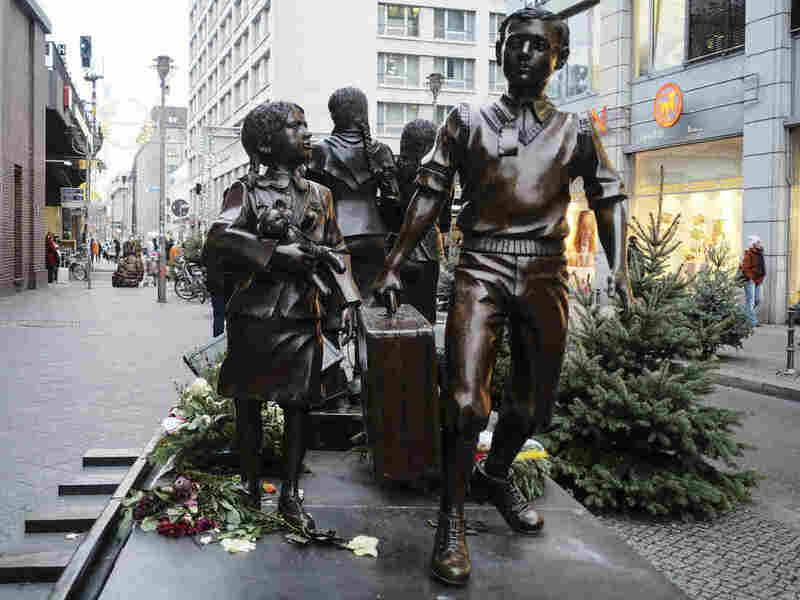 The German government has agreed to make a one-time payment to Kindertransport survivors, commemorated by a statue in Berlin, Germany. Stuart Eizenstat, the Claims Conference Special Negotiator who worked on the deal with the German government for three years, told NPR the one-time payment is "a symbolic gesture because these are children who went through enormous psychic trauma that haunts many of them to this day." "After having to endure a life forever severed from their parents and families, no one can ever profess to make them whole," Eizenstat said, adding that the survivors, now in their 80s and 90s "are receiving a small measure of justice." December marks the 80th anniversary of the first transport operation from Berlin to Harwich, England, on Dec. 2, 1938. The U.S. Holocaust Memorial Museum reports the first mission rescued nearly 200 children from a Jewish orphanage that had been destroyed in the Kristallnacht pogrom — a violent and orchestrated attack on Jewish synagogues, businesses, hospitals, homes and other properties — across Germany, Austria and what was then, Sudetenland over the course two days that ended in widespread fatalities and the arrest of thousands of Jewish men who were dragged to concentration camps. The last convoy to leave from Germany departed just two days before Great Britain entered the war on Sept. 1, 1939. The last transport from the Netherlands left for Britain eight months later on May 14, 1940, the same day that country surrendered. Jewish groups inside Germany coordinated the trips and arranged for some of the children to live with sponsors. Other children were placed in foster homes, hostels, schools or farms. Some children over the age of 14 were "frequently absorbed into the country's labor force after a few weeks of training, mainly in agriculture or domestic service," according to an American group, The Kindertransport Association. Eizenstat said the money is a special acknowledgment that "despite all of the politics — of nationalism and xenophobia — that is roiling the country today" Germany remains committed to righting the wrongs of its past. The €2,500 compensation matches a payout given through the Claims Conference's Child Survivor Fund in 2013. That settlement, also reached with the German government, went to Holocaust survivors whose lives had been torn apart as children. The same year, the group negotiated a payment that included "flight victims" who had fled to Russia or other parts of the former Soviet Union. Until then, Germany only paid survivors "who had escaped from countries they had occupied so the hundreds of thousands of people who made it to Russia had never been paid," according to Eizenstat. He said the sum, though modest, is likely to come as much-needed relief for many Holocaust survivors living in poverty in the U.S. and elsewhere. Next year, the organization will distribute approximately €480 million (about $545 million U.S.) in aid to more than 60,000 survivors in 83 countries, Eizenstat said. The organization estimates there are approximately 1,000 Kindertransport refugees still living around the globe. About half live in the U.K.
"While no amount of money can ever compensate for our emotional or material losses, this award recognises our experience of being separated as children from our parents and having to live in an alien country with a foreign language and culture, and the unique story and act of rescue of the Kindertransport," Sir Erich Reich, chairman of the Association of Jewish Refugees said in a statement.